In Austria already since the time of the settlement by the Celts Winegrowing operated just under 3,000 years ago. The Burgenland community Zagersdorf and the Lower Austrian community Stillfried in the Weinviertel are considered the oldest wine-growing communities in Austria. In both places grape seeds were found, which from the time 700 and 900 v. Chr. Chr. Originate and clearly the species Vitis vinifera are assigned. The lifting of the emperor Domitian (51-96) ban on the planting of vines outside Italy by emperors Probus (232-282) had a positive effect on viticulture. For in the Roman provinces of Noricum (Upper and Lower Austria) and Pannonia (Burgenland) an orderly viticulture culture began. In the almost 200 years of turmoil of the migration of peoples from the end of the 4th century, viticulture almost came to a standstill due to many devastations. A revival took place again only from the 9th century under the influence of Emperor Charlemagne (742-814). Special services to the viticulture are the order of the Benedictine and Cistercian attributed. In the Middle Ages were mainly the monasteries Stift Göttweig (Kremstal) Stift Klosterneuburg (Wagram), Stift Melk (Wachau) and Stift Heiligenkreuz (Thermenregion) Carrier of the viticulture culture. This also made a significant contribution Dinstlgut (Wachau). The oldest Austrian winegrowing regulations with regulations regarding working hours and stipulated punishments in case of grape theft stems from the Habsburg Duke Albrecht II (1298-1358) from the year 1352. Already in the Middle Ages there was also a classification into wine quality classes. In the 16th century, viticulture reached its peak in Austria, the vineyard was at least three times as large as today (50,000 ha) with about 150,000 to perhaps even 200,000 hectares. The Salzburg monk mountain was also planted with vines as the slopes of Semmering. There were vineyards near Linz ( upper Austria ), at Salzburg and to a large extent also in Carinthia and Tirol, And the capital Wien is literally built on vineyards. The wine book of the clergyman Johann quickly (1540-1612) describes in detail the viticulture, the cellaring techniques and the drinking culture this time. Due to the advent of the beer, high tax burdens and the Thirty Years War (1618-1648), however, it came in the 17th century to a decline. Above all, the tax brought problems, too Ungeld It has been increased from 10% to 30% within just twelve years. As a result, many vineyards were cleared and wheat or other products were grown instead. Now inferior grape varieties were preferred and cheaper mass wine won. Under Maria Theresa (1717-1780) orders were issued for the use of cheap wine. It originated many vinegar-settlers, liquor distilleries and mustard production grape, Under Emperor Josef II (1741-1790) was allowed on 17 August 1784 in a written decree, the own made at place also to sell in your own house. He thus laid the foundation for the this year, In the 19th century, there were some disasters. An extreme cold snap, imported from America fungal diseases, as well as a negative climax the phylloxera devastated whole wine-growing areas. The pest probably reached Austria in 1867, when August-Wilhelm Freiherr von Babo (1827-1894), director of the founded in 1860 Klosterneuburger Weinbauinstituts, from Germany got American vines. A milestone in the Austrian wine history was by Robert Schlumberger (1814-1879). This presented in 1846 after the Méthode champenoise produced "Vöslauer white sparkling wine", which became a great success. After the Second World War, the old structures were changed through rationalization and mechanization. The change to the new one training system the so-called high culture by Lenz Moser III. (1905-1978) in Rohrendorf at Krems in Lower Austria enabled the use of state-of-the-art equipment. By using diethylene glycol it came in 1985 to wine scandal, As a result, stricter laws and, above all, controls were introduced in Austria, which made a decisive contribution to improving quality. In 1993 the project became Certification of vines started with the aim to improve the quality in the long term by analyzing and selecting the best possible vine material. Austria is characterized by a continental-pannonian climate. There are cold winters and hot, dry summers with a long one growth cycle, Warm, sunny summer days with often cool nights and mild autumn days are typical of most wine regions. The average annual rainfall in the East is 400 millimeters, in Styria it can be 800 millimeters or more. Positive influence have the Danube and Lake Neusiedl in Burgenland. On the banks of the second largest steppe lake in Europe, grapes of the predicate stages often mature in late autumn outbreak. Beerenauslese and Trockenbeerenauslese approach. Due to the often very low temperatures from December to January, there is also considerable production in the East Eiswein possible. The altitude is usually about 200 meters, in Lower Austria to 400 meters, the highest vineyards are located in Styria to 560 meters above sea level. The vineyards are mostly in temperate climates without extremes, such as on the 47th and 48th parallel; comparable to the French Burgundy, The soil types are quite different. In Lower Austria, in the Weinviertel and in the Danube valley loess, in the Kremstal valley and in the Wachau primary rock and in the Thermenregion Kalk prevail. In Burgenland, the soils consist mainly of slate, clay, marl, loess and sand, as well as of brown earth and volcanic soil in Styria. The figures refer to surveys in 2017 ( BKI and ÖWM ) compared to 2009. The number of holdings has been greatly reduced from 45,380 with an average farm size of 1.28 hectares (1987) to 20,181 with 2.26 hectares (2009) and finally to 14,133 with 3,2 hectares. The number of small businesses (with sales volume below 5,000 liters) has almost halved. Many small vintagers with one hectare and less vineyard size have sold their land to larger farms or abandoned the management. The number of efficient plants over 30,000 liters has risen from around 970 to 1,450. The number of producers bottlers Qualitätswein has dropped from just under 6,500 companies to around 4,000. There were 2,486 million hectoliters of wine produced, of which 1,649 white wine = 66% and 0.837 red wine = 34%. The long-term trend from white wine to red wine has not continued (see also under Wine production volumes ). In Austria, 26 white wine and 14 red wine varieties are considered Quality wine-grape varieties defined, which may be used for all quality types. The terms white burgundy, gray burgundy, blue burgundy, Rhine Riesling and Blaufränkisch are not permitted for "wine with and without grape variety / vintage" in order to exclude confusion due to supposedly indicative regions of origin (Burgundy, Rhine, Franconia). Instead, however, the names Pinot Blanc, Pinot Gris, Pinot Noir and Riesling are allowed for these wines. In addition, there are additional permitted grape varieties for these wines. The largest vineyard area in 1980 was 59,432 hectares. From then on, the white wine areas were continuously reduced and the red wine areas expanded. This trend was last stopped. Austria is a typical white wine country, special red wine areas are Central and Southern Burgenland, West Styria and the Thermenregion. In 2017, the vineyards covered a total of 46,515 hectares of planted vineyards (in 2009 there were 45,908). Of these, the red varieties account for 15,370 hectares = 33% (15,770 ha) and the white varieties 31,145 hectares = 67% (30,138 ha). Compared to 2009, there were no major changes. Grüner Veltliner is also the largest producer of all varieties, with 6.3%, the undisputed leader with almost one third of the total area and almost half of the white varieties. The red wines are dominated by the Zweigelt followed by the varieties Blaufränkisch and Blauer Portugieser. late vintage : At least 19 ° KMW; fully ripe grapes. choice : At least 21 ° KMW; fully ripe, picked grapes. Beerenauslese : At least 25 ° KMW; overripe and / or noble rotten grapes. outbreak : At least 27 ° KMW, only noble rotten, overripe and dried berries. The designation may only for the Ruster outbreak be used. Trockenbeerenauslese : To the. 30 ° KMW; noble rot, shriveled grapes. Strohwein : Since 2002, alternatively, the term reed wine is permitted. At least 25 ° KMW must weight. Must be made from fully ripened and sugar-rich berries that had been stored on straw, reeds or hung on strings for at least three months prior to pressing. According to a law amendment in 2002, however, the grapes can also be pressed after two months, when a must weight of at least 30 ° KMW is reached. If the must levels are not reached, the wine may (must) be marketed as quality wine. Eiswein : At least 25 ° KMW. The grapes are pressed and pressed frozen. If the degree of must is not reached, the wine may (must) be marketed as quality wine. Winery : Designation for wine, regardless of quality level, made exclusively from grapes harvested in Austria and produced in Austria. However, the wine may only be delivered to retailers by 31 December of the year following the harvest and to the consumer by 31 March of the following year. Heuriger is also the common name in Austria for Buschenschank. Storm : Protected name for a partially fermented grape must. The existing alcohol content must be at least 1.0% and can be up to 10% vol. Biowein : The production is subject to at least the guidelines according to the EU Eco-Regulation, as well as the often even stricter rules of organic associations. The Austrian umbrella organization is Bio Austria (see also under Organic viticulture ). The Austrian standard reference regarding wine right is "Weingesetz" (Manz publishing house), which in the 2012 published 5th edition comprises 818 pages. It provides a representation of the entire wine law including all regulations and EU regulations. Furthermore, there is the electronic database RIS (legal information system) with, inter alia, wine law contributions (see also under wine law and EU regulations ). Mostgewicht For every quality level there is a minimum must weight (see above). earnings : For wine without grape variety / vintage maximum of three times the average yield per hectare of a holding; for all other quality grades a maximum yield per hectare of kilograms of grapes or liters of wine applies. If the maximum quantity is exceeded, the entire harvest of a vintage must be marketed as a wine without a variety or vintage designation. The yield must by means of harvest declaration the BKI (Bundeskellereiinspektion), which also checks for compliance. The maximum amount per hectare is 9,000 kg of grapes or 6,750 l per hectare of vineyard area registered and planted in the vineyard register for the production of wine, land, quality or predicate wine (1.33 kg of grapes yields 1 l of wine). Following the conversion of the vineyard index to the substantive requirements of the integrated administration and control system, this maximum quantity per hectare amounts to 10,000 kg of grapes or 7,500 l of wine. Until the changeover (probably in 2018), the Federal Minister for Agriculture, Forestry, Environment and Water Management can reduce or increase the maximum hectar amount for the harvest of a year by up to 20% by ordinance at the request of the National Wine Committee, if this is the climatic or winemaking conditions for require this year. This authorization was used for the 2016 vintage and the maximum yield increased from 9,000 to 10,800 kg / ha. ancestry In the case of wine (without grape variety / vintage), only EU or Austria may be used; for land wine, the winegrowing region must be indicated; smaller units (winegrowing area, large estate, municipality) are not permitted. From quality wine, closer origins (winegrowing region, winegrowing area, large-scale estate, municipality, Ried in connection with commune names) may be used if the wine is 100% from the specified area. vintage : An indication is only permitted for wine without grape variety / vintage. For the other quality levels, the proportion must be at least 85% of the given year. sweeteners Dosage do not count to the 15%. In the next year (January or later) harvested Eiswein indicate the previous year. varieties : An indication is only permitted for wine (without grape variety / vintage). For the other quality grades, the proportion must be at least 85% of the grape variety indicated. In the case of two or more grape varieties, the names may be given in descending order according to their quantity, if they add up to 100%. The indication unmixed is only allowed if the wine is 100% from the grape variety mentioned. For late harvesting and readout the grape variety (s) must be indicated. The mixing of grapes, mash, cider or wine from red wine and white wine grapes is only allowed for wine without vintage / variety. These wines may not be referred to as red wine or white wine, but only as "wine from Austria". sweetening (Increase residual sugar): Wine with and without grape variety / vintage may be sweetened by a maximum of 4% vol alcohol content; this is about 68 g / l residual sugar which corresponds to approx. 5 ° KMW. On the other hand, country wine and quality wine may be sweetened up to a maximum of 15 g / l of residual sugar. Landwein (that is new) and Qualitätswein (the same) can be sweetened up to a maximum of 15 g / l of unfermented sugar. This can be done by adding grape must, concentrated grape must or (which is rare) RTK (Rectified grape must). Sucrose is as sweeteners forbidden. Sweetening is not permitted for Cabinet and Prädikatswein. enrich (Increase of natural alcoholic strength): For all types of wine a maximum of 2% by volume of alcoholic strength may be used by authorized means. After application, the maximum for land wine and quality wine is 18 g / l residual sugar permissible (previously 15 g / l). The alcohol content of wine with and without grape variety / vintage for white wine may not exceed 12%, for red wine it may not exceed 12,5% vol. with white country wine or quality wine up to a maximum of 13.5% vol; as well as red country wine and quality wine up to a maximum of 14.5% vol alcohol content. In Cabinet and Prädikatswein enrichment is principally not allowed. Influential wine writers or wine critic are Christa Hanten, Helmut O. bang, Walter coachman, Peter Moser, Michael Prónay, Peter Schleimer, Viktor Siegl and Rudolf Steurer, They work in many wine magazines and wine guides as A la Carte - Magazine for Drinking and Food Culture. 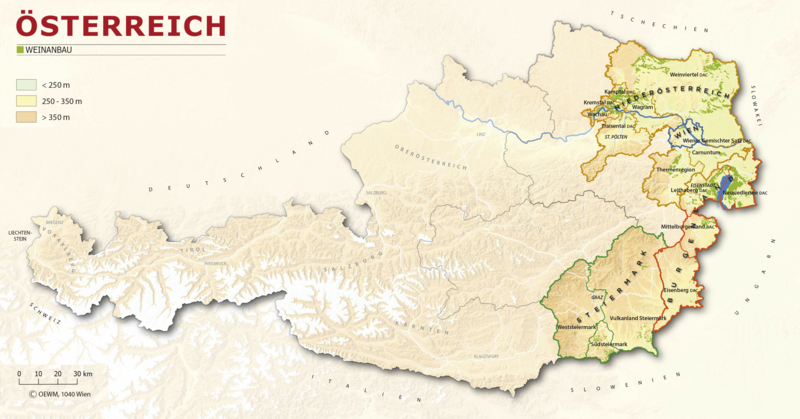 Falstaff Wine Guide Austria / South Tyrol. Gault Millau. Coachman's food notes. Vinaria Wine Guide and Wine-Guide-Austria / Wine-Times. This page was last modified at 11 April 2019 at 16:48.